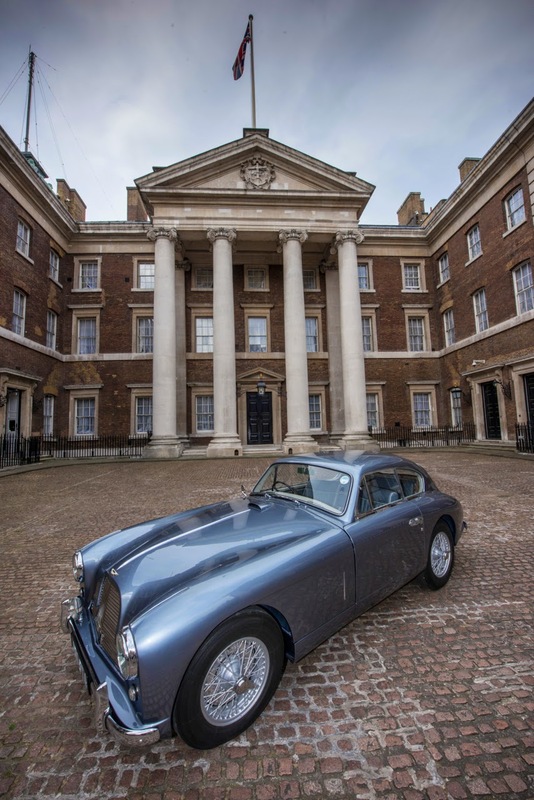 Last Tuesday a 1954 Aston Martin DB 2/4, which is understood to have been the inspiration for James Bond’s Aston Martin, was unveiled by international auctioneers Coys at the Old Admiralty Building, where Ian Fleming had his office. 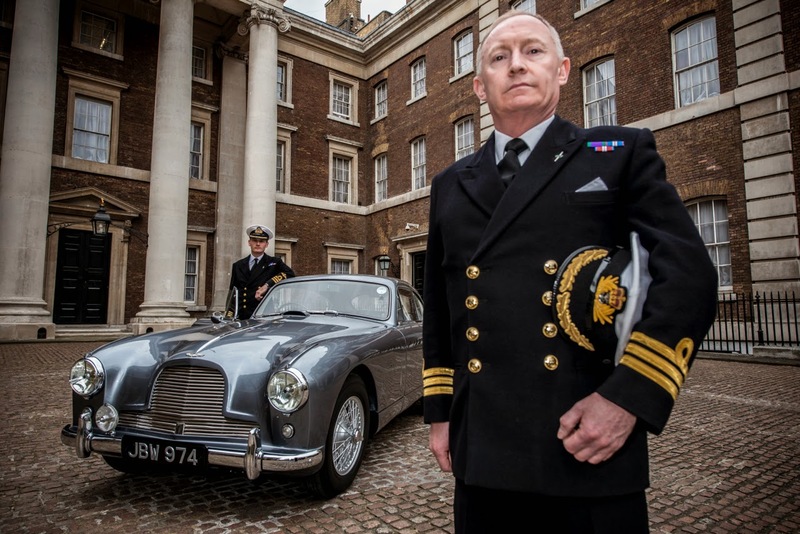 The car, which will be auctioned at Coys’ traditional Blenheim Palace sale on 12th July, is believed to have been the inspiration for the Aston Martin featured in the original novel Goldfinger. This model is a Vantage specification 1954 DB 2/4 Mk I, bearing the registration JBW 974. For many years it sat idle, collecting dust and rust, until a father and son purchased it for restoration. It was during the restoration that a set of unique special modifications came to light, along with the car’s connections to the British Intelligence Service and the creator of Bond himself, Ian Fleming. These one-off features seem to be the same as the fictional Bond car in Goldfinger, including reinforced steel bumpers, concealed lockers, heavy-duty anti-interference ignition system, driver’s seat connections for two-way radio and/or a homing device, and a Halda Speed Pilot device, which accurately computes time and distance in relation to a pre-selected average speed. “The story around this car and its discovery is phenomenal. It was supplied new on 4th July 1955 to the Honourable Sqdr. Ldr. Phillip Ingram Cunliffe-Lister DSO, whose father was Lord Swinton, a close confidant of Winston Churchill and head of MI5 and the Security Executive during WWII. Moreover, the vehicle was regularly at Ian Fleming’s direct next-door neighbour in Kent, and indeed it was the next-door neighbour’s house which was also used as inspiration in the Bond novels, this time as Sir Hugo Drax’s residence in the novel Moonraker. The car was on show at the Stratstone of Mayfair Aston Martin showroom on Park Lane, 113 Park Lane, London W1K 7AJ, until the end of last week. It is now on display at the foyer of the Grange St. Paul’s Hotel, 10 Godliman St, London EC4V 5AJ. 1. The man who bought the car was Sqdr. Ldr. Hon Philip ‘Ingram’ Cunfliffe-Lister DSO. His father was Sir Philip Cunliffe-Lister, Lord Swinton the 1st Earl, who was a close confidant of Winston Churchill and head of MI5 and the Security Executive during WWII. 2. Ian Fleming was very keen on sports cars even to the extent that he was once the co-driver for Britain’s top rally driver, who was at the time none other than Donald Healy, the famous sports car manufacturer. As the evidence shows, the new Aston owner Ingram also competed in lots of international rallies. And had his new Aston equipped with ‘extras’ for competitions. 3. In 1952 Ian Fleming bought a seaside house from Noel Coward in a small village near Deal in Kent. In the same village, and at the same time, Ingram’s friends Dennis Ramsay, the famous portrait painter, and his wife Rose, the godmother to his son Michael and the daughter of Simms who founded the RAC, bought the nearest house to Ian Fleming, called Hope Bay Studio. Ingram’s son Michael Cunliffe-Lister is alive and well as has clear recollections of visits with his father in the 1950s. He travelled from Lincolnshire for sentimental reasons to view the restoration work on his father’s car. 4. Around 1954 Ian Fleming then wrote his next James Bond novel ‘Moonraker’. Fleming must have known the Ramsays, who lived in Hope Bay Studio. He knew their house very well because he included it in the book he was currently writing, making it into Sir Hugo Drax’s house and rocket base. 5. In 1955, Ingram continued to compete in international rallies and the new Aston Martin he had purchased was fitted with ‘extras’ for next year’s season. By that year, Fleming had written six books with Bond’s car being a Bentley, but then, in his new book ‘Goldfinger’ he gave Bond an Aston Martin, and coincidentally it is the only Bond car in Ian Fleming’s novels to have gadgets installed that are so similar to this car that it makes any coincidence extremely unlikely.